The explosive Transformers saga continues with Bumblebee. With the fate of Earth at stake, heroes must rise in an epic struggle to forge a future for all. Join the action with this Tiny Turbo Changers collection. Tiny Turbo Changers figures deliver fan-favorite characters from Transformers movies in a collectible 1 1/2-inch size Get ready for an epic lineup of convertible figures. Each figure converts in 1 to 3 easy steps. Grab a piece of the Transformers lore and become part of the legend. 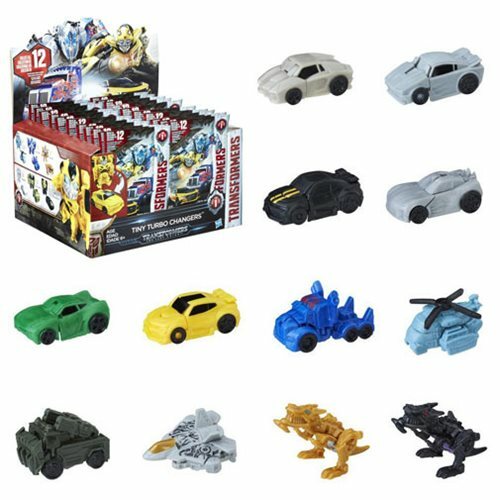 Figures amay include Barricade, Sentinel Prime, Phantom Strike Lockdown, Silver Knight Optimus Prime, Evac, Autobot Ratchet, Bumblebee, Sky Rage Starscream, Autobot Drift, Ironhide, Autobot Dino, and Dinobot Slug. Set includes 6 random individually packaged figures. Ages 6 and up.